Cut the aubergine in pieces and the pumpkin in half . Season it with coconut oil and cinnamon. Put the aubergine and the pumpkin in the oven for 40 min approx. Steam the broccoli for 5 min approx. Put water to boil with the juice of 1/2 lemon , a pinch of salt and a tablespoon of soy sauce. Add the rice and cook over medium heat for about 20 minutes . Serve the rice in a bowl and add the hummus and pesto. Cut the aubergine, broccoli and pumpkin into small pieces and mix with rice. 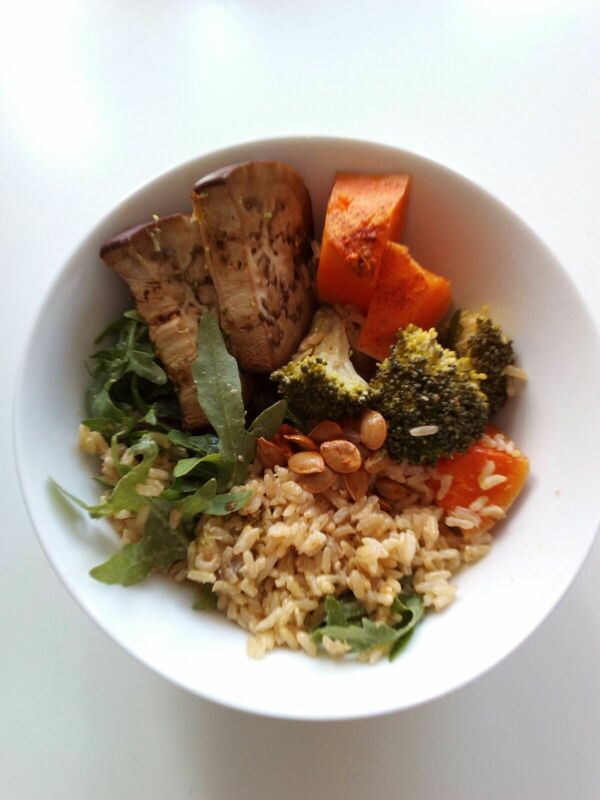 The brown rice is full of protein, the pumpkin is a source of magnesium, and the brocoli detoxifies our organism!